Everything You Need to Know About Dropping Naps. Know when to drop naps and how to drop naps. 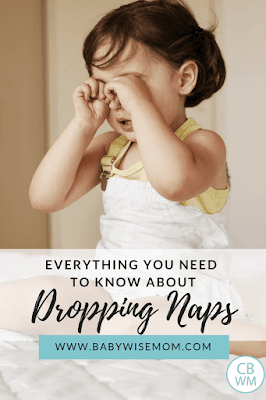 While the exact time frame for dropping naps varies from baby to baby, the time frame is usually in the same ballpark. Many naps are naturally dropped as feedings are decreased on the Babywise schedule. You drop a feeding, so there are fewer naps held in your Eat, Play, Sleep routine. Other naps are dropped without dropping a feeding. Something to remember as you drop naps, you might need to move bedtime up and/or allow for longer naps. Babies don’t really get less sleep as the drop naps, they just rearrange when they get the sleep. Here is a summary of our nap dropping experience. You know your baby is ready to drop a nap when he stops sleeping well for one of the naps. It can either be the nap that needs to be dropped, or one following it. It could even be nighttime sleep is disrupted because he is sleeping too much in the day. Not sleeping well can be displayed both in taking a long time to go to sleep and also waking up early from a nap. Also, take note of your baby’s age. Not sleeping well can also mean your baby just needs longer waketimes. But if your baby is at an age where a nap is typically dropped, there lies your answer. Some babies are ready to go to three naps before they are ready to move to a 4 hour schedule (which is the natural transition to three naps). This would typically happen around 4 months. If this is the case with your baby, simply drop the nap between your last two feedings. Take note that the last two feedings might then move closer together because a baby can go longer between feedings if he is asleep than he can when he is awake and staring at his source of food. He will also be fussy for a few days during that time. He will adjust and get used to it and be back to himself. The next nap you lose is the evening nap–typically a short 45 minutes. According to BW, this happens pretty young (around 6-8 months). Brayden didn’t drop his until he was about 10 months old. I was reading BW and realized he was not supposed to need it, so we dropped it. Kaitlyn is currently nearly 9 months old and still takes a third nap most days. It can be hard to tell just when your baby is ready to drop this nap because it is already short as it is. If your baby doesn’t seem tired enough for bed after napping in the evening, that would be a sign. Also, you can wait to put baby down until he gets fussy rather than when it is time. I have found Kaitlyn doesn’t need a third nap if she slept really well for her other two naps. If she didn’t, she needs that nap. You can be flexible with it. Rules for dropping this nap are the same as any other. Expect some fussiness as your baby adjusts. Be ready to be an entertainer. You could get a new toy or book or something to pull out only at that time of day to keep the baby happier. When Brayden dropped this nap, I remember he was kind of cranky during the stretch for several days, maybe even a week, but his body adjusted. Dropping this nap might move bedtime up. Dropping the morning nap is not as sad as it may seem. You suddenly have a large chunk of time when baby doesn’t have to be home! You baby will also most likely take a longer afternoon nap once the morning nap is dropped, so you have a longer stretch in the afternoon to get things done. You also might need to move bedtime up. Babywise can be confusing on the ages for this. Several different books talk about it, and they all have different numbers. The numbers range from 14-22 months, and all are accurate. By this point your baby is now a toddler. Toddlers vary in their need for sleep, just like babies and adults. Brayden dropped his at 17 months. The time to drop the morning nap kind of displays itself more than other naps. When your toddler is ready to drop this nap, he will still sleep really well in the morning, but for the afternoon nap, he will hardly sleep at all. This is when he is ready to drop the morning nap. In my experience, they are not as cranky for this dropping of a nap as they are for others. When we dropped this nap, the afternoon nap went to 3.5 hours instead of 2 and bedtime moved up an hour. As they get older, the nap will shorten and/or bedtime will be moved back slightly. When we dropped the morning nap, we moved the afternoon nap up to 1:00. Some toddlers may need a nap sooner in the day. BW says the nap happens after lunch. Thankfully I have no experience in this yet! This is not supposed to happen until at least 3 years old. If your child seems ready (or claims to be), I would watch for some things. One would be that if you miss a nap, is your child a wreck that evening? If your child cannot be happy without a nap, I would still have one. Even if it is short. Tired children become naughty and disobedient. Another thing I would watch for is if your child isn’t going to sleep at bedtime. If it is summer, negate that. Brayden is a sun sleeper, up and down with the sun, so he sleeps much less in the summer. But if it is winter and he isn’t falling asleep quickly at night, I would first shorten the afternoon nap. Some kids need naps even into Kindergarten age. Once you drop the nap altogether, do a quiet time, or rest time. This is when you put the child in bed, or your bed, or somewhere you know he will go and stay. You give him books and tell him to rest. This will make a world of difference! There are times Brayden never goes to sleep for his nap, but he is much better behavior-wise if he has been in his bed missing a nap than if he has been out playing and missing a nap. Quiet time can last anywhere from 30-60 minutes. It gives your child a chance to relax and take a time out from the business of their world. We know they don’t do it themselves! And take note that dropping this nap does not have to be one day they are napping, the next day they are not. On Becoming Preschoolwise puts it this way, “Children don’t suddenly one day stop napping forever. Everyone benefits when Mom sees it as a weaning process” (p.100). To wean someone is to “accustom [them] to manage without something on which they hae become dependent or of which they have become excessively fond” (American Oxford English Dictionary). Brayden did just fine with the “cold turkey” approach for his other nap-droppings, though it did take him a week or two to be happy without it as he adjusted. I will be taking the weaning approach with him when I drop his only nap. See the Weaning from Naps post for more thoughts on this idea. Some days, your child will nap, other days he will just rest. That is just fine with the weaning process. Hi Again! My little one seems to be very against his very first nap of the day. Is it just that we are doing CIO and he has enough energy in the AM to cry through the entire nap? He has done it consistently for about 4 days now. I have adjusted the time that I put him down and there doesn’t seem to be a difference. He’s 7 weeks old – seems really early to have him awake from 7:00AM-11:00AM (eats at 7 and 10). What do you think? That is too long for him to be awake, and he will need a morning nap until he is 14-22 months old, as you saw in this post. I would keep a log and analyze what is going on with that nap versus other naps when he is successful. It might just be that he is learning and the first nap is difficult for him. How long is your waketime? At that age, it will likely only be 45 min. to an hour. Be sure you are in that range. Also, for many the first wake time of the day is shorter than others. My 15 month old went through a week & couple days just as described – sleeping 1.5 hours in the morning, then suddenly won’t nap at all during the normal afternoon nap time. We figured it was time for him to drop his morning nap. So, today, I took him out for errands in the morning, then came back for lunch. Then at 1pm, he fell asleep! The only problem that I saw today was that he didn’t eat lunch well and was sort of moody due to the dropped morning nap. I’m hoping this behavior will correct itself in time. It will. Some kids need to go down a bit earlier at first, too. Honestly, you will love having all of that time in the morning! At least I did. It took my son about a week to get used to no nap. Yikes, he only took a 1.5 hr nap even though he was really tired from the dropped nap. Will the nap time eventually increase to 3-3.5 hours? That is totally normal. It should get longer once he gets used to it. Right now he is over-stimulated, but once his body adjusts, he should take a nice long nap. I would move bedtime up if you drop that nap. You could also movoe the nap later–so if it is 4:30 now, try 5. But wake when you would if he went down at 4:30. 6 months is the age you can drop that nap (some go later)–and if your baby is earlier, you can certainly do it earlier. Oh, and thanks for the thanks! My daughter just turned 16 weeks old. Up until now we have had a very happy routine with good naptimes and night sleep. At three months she was consistently sleeping 10 to 6. So I started to gradually move her bedtime up and went down to five feedings a day. Her last feeding is now around 9pm. Since doing this she has been extending her nighttime sleep to 9 or 10 hours.The longer night sleep has been great, but her naps have become a mess. Waking up at cycle shifts, crying when going down, etc. Even when she goes down well she can’t make it for more than an hour. I know she is not rested as she grows cranky and is drowsy while nursing. This is abnormal for her. I have tried dropping the catnap she used to take before her bedtime, but she has been very fussy about it and inevitably ends up falling asleep in my arms. She sleeps for 20 or so minutes then we begin our bedtime routine and she still sleeps for 9+ hours. When she misses this catnap she does not go down for bed without a fit and does not sleep as well.I think she is napping too often, but am not sure how to reorganize things. Do I need to move her bedtime earlier? I know something is amiss, but I am stumped over how to make this transition. Thanks for the help. Four months old is often a hard time for babies for naps or night or both. 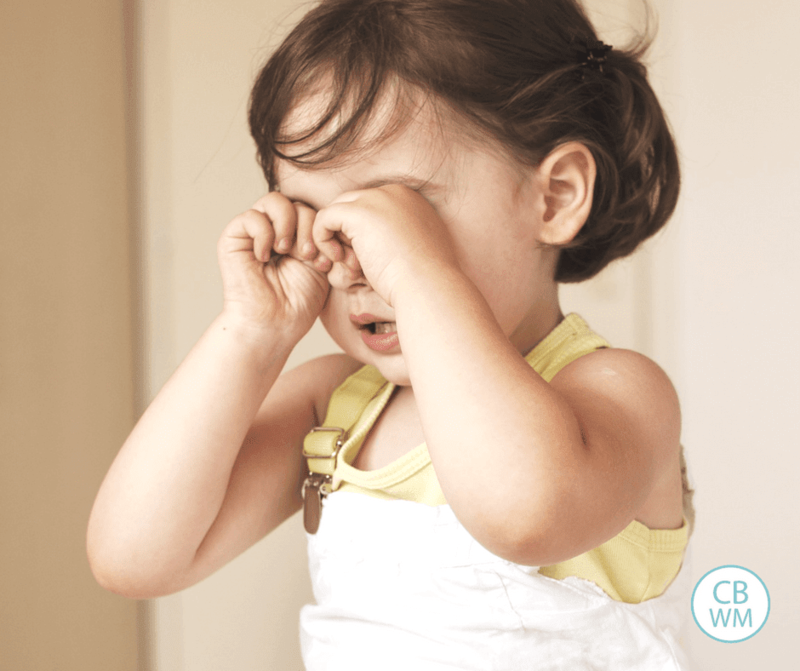 I would check out this post:Naps: Troubleshooting: http://babywisemom.blogspot.com/2007/12/naps-troubleshooting.htmlLet me know if you have questions beyond that. Next Post Poll Results: What age did your baby start sleeping 7-8 hours at night consistently? Hi, I first want to say thank you for your blog!! In my circle of mommies, none of them are using BW principles, so this is so nice to be able to get feedback from you. Our only child, Ellie, is almost 17 months old and we have used BW her whole life. Ellie is showing signs of dropping her morning nap – as you said I can’t wait to have a longer block of time when we can be away from the house. My question is on how to drop the morning nap. Do I shorten her morning nap by 15 minutes and then put her down 15 minutes earlier for her afternoon nap, doing this for 3-4 days and then shorten again? I think that’s how we dropped her 3rd nap – but I can’t quite remember. Again thank you for you time!! I have a 4 month old who I am trying to get back on track after visiting relatives on and off for the last month or so. I am still feeling out her wake time, but it seems to be between 1:30 and 2 hrs. She has been doing the 45 min nap thing until today, when both naps so far have been past that fateful 45 min mark! My real question is on being on a 3 nap schedule. From your post it seems you would feed after the 3rd nap (like normal), play time (like normal), then feed again, and put baby down. The problem I am having is that this lends itself to having my baby nurse herself to sleep for her last feeding before nighttime sleep. Any way to get around it, or is it just part of doing 3 naps? Thanks! My kids didn’t fall asleep while nursing when we dropped the fourth nap. You might need to move bedtime up a bit for a while to prevent her from falling asleep. Or you will have to work to keep her awake. Good luck! Hi, my daughter turns 1 tomorrow and we have been really struggling with her naps. she sleeps 1-1.5 hrs in the morning- about 9:30-10:30 and cannot fall asleep in the afternoon. she used to nap at 9 and 1, but I have tried putting her down at 12:45, 1, 1:30, 2:30 and still no luck. some days she has fallen asleep around 3 or 4, which makes her unable to fall asleep at 7, so she talks for up to an hr, sometimes longer. most days though she doesnt take an aftn nap and I put her to bed at 6 or 6:15 b/c she is so cranky. and that makes her wake up earlier- at 6:15 instead of 6:45 or 7, thus reinforcing the morning nap b/c she has been awake so long… Please help! mhighsmith,There are several possible solutions. One would be to move the morning nap later, then the afternoon nap later (shift both naps back). Another is to extend the waketime before the afternoon nap. I would try shorter intervals. I wouldn’t go any earlier than 1, but try 1, 1:10, 1:20, 1:30, 1:40…maybe 1:45. With my daughter, 5 minutes can make the difference. You can also shorten the morning nap so she will be more tired for the afternoon nap. You can either wake her up after an hour or put her down later but wake her at the same time. It sounds like she is starting to transition toward dropping that morning nap, but is too young to do it yet. Work with things and see what works. Good luck! My 2 month old has difficulty with his 4th nap. He sleeps wonderfully for the first 3 naps (1 hour of wake time and 2hr naps). In fact, I usually have to wake him up. He also has just started STTN after letting him CIO one night. But the last nap of the day he does not sleep. I tried CIO but he ends up crying the whole time. I thought it was maybe because it is the hottest time of the day and he is swaddled so maybe he was just too hot. But today I have swaddled him with no clothes and a cool sheet and still no sleeping. After I put him down he stayed awake for 1.5 hours of his nap just looking around and he just started crying right now. I gave him his pacifier because that always soothes him but now there’s only half an hour left of his nap! Is this a sign he is ready to drop this nap? From what I’ve read it sounds like he might be too young, but it’s very consitent day after day. He is really young to drop right now. It is normal to be fussy at that time of day, so he might be fussy. I would perhaps go for a longer waketime length at that time of day and shoot for a shorter nap. If all he took was a 30-60 minute nap, that would be just fine. Also, so long as he is napping and sleeping well, I would think the swing at this time of day would be just fine if that will calm him. But I would go for the other ideas first. My almost 7 month old has been having a hard time settling in the evenings for bed. He will usually talk/fuss/cry for 30-90 minutes before going to sleep. I’ve tried to have a short and long 3rd nap but it doesn’t seem to make much of a difference. He also seems pretty fussy when I am getting him ready for bed even if he has had a long 3rd nap. I’ve tried having no 3rd nap but he is obviously not ready for this because I have to keep him extremely entertained to prevent him from being really fussy and then he is so tired he falls asleep while eating before bed.Any thoughts on what is going on and what I should do?Thanks much! With daughter #2 (now 4 months old) I have found it a lot harder to tune in to her needs than I ever did first time around and she is yet to consistently sleep 7-8 hours per night from her dreamfeed. She does know how to self-settle to sleep and it is rare for her to cry in bed at a normal sleep time but she will wake at least once in the night anywhere between 2am & 5am often only talking at first but descending to crying when ignored. Therefore, I nurse her on one side before putting her back in bed. I have thought I might need to just let her cry it out to break the habit but I don’t want to disrupt my eldest daughter’s sleep as she has no daytime sleeps anymore. Therefore I would rather try to feed baby a lot during the day in the hopes that she will learn to sleep all night without the wake-up in the early hours of the morning. Her first full feed of the day is 6am, for which I set the alarm. It is a long feed and diaper change and then back into bed within 45 mins for a 1 ½ hr sleep so I can get my eldest daughter ready for preschool. Does the 1 ½ hr sleep at 6:45am count as a nap because if it does she still has four naps per day? Since she can quickly go to sleep after 45 mins first thing in the morning, I’m not sure if this is a waketime or more like an early morning feed, meaning her wake-up is 8:30am. I try to feed at 6am, 9am, 12pm, 3pm, 6pm, bedtime is 7pm, dreamfeed 10pm. Do you think I should continue with the 3 hr daily schedule and 4 naps until she is sleeping until 6am consistently or is she too old for this? At all other daytime feeds her optimal waketime is 75 minutes. Also, if left to her own devices she will do one 4 hour gap between feeds in a day. So, my other option is to let her have that one extended nap in a day so that I can feed at 6am, 9am, 12pm, 4pm, 6pm keeping her up between 4pm and 6pm without a fourth nap. Which would be your choice from these two options if she is to learn to sleep longer at night? She is at the age for dropping the fourth nap. I think I would try no nap between 4 and 6. You might need to move bedtime a little earlier, which should be fine since she wakes so early to eat. I totally understand you desire to not disrupt older sister, that is one reason I never did CIO with Kaitlyn in the night. I knew she didn’t need the feed anymore, but stopped it other ways (see Early Morning Feedings Before Waketime: http://babywisemom.blogspot.com/2008/01/early-morning-feedings-before-waketime.html). Good luck with it all! I hope I am posting this in the correct place … I have an almost 6 month old and we have following BW since day one. He is sleeping 11 hours at night and has been for almost 2 months. He wakes at 7 am for his first feeding and is usually ready to go back down with 50 minutes. He starts getting fussy and rubbing his eyes as sleep cues. This has always been his shortest wake time and up until this week he will go back down and sleep for 1 1/2 to 2 hours. However, for almost every nap everyday he relegiously wakes up 45-55 minutes into the nap. We have a video monitor so I have been able to see the pattern. He wakes up plays happily for 15-20 minutes and then starts rubbing his eyes, crying and yawning. It is usually at this point that I go in and put his pacifier back in and he goes back down. Up until a few weeks ago I was also able to roll him back onto his side and he would go back to sleep. Now he fights being rolled and will not allow it. He also has started staying awake for much longer before falling back to sleep. Needless to say naptimes are starting to feel like a battle. Sometimes, he will not go back to sleep. He may either cry or just lay in the crib quietly, but he isn’t getting a full nap. This is especially true of his first nap, but the pattern has been seen in all naps at this point. I am trying to extend his waketime for the 1st nap, but he is done at about 1 hour and 15 minutes. He still wakes at 45 minutes in and for the past few days has not gone back to sleep at all. We are still on a 3 to 3 1/2 hour schedule. He can’t go four hours yet, however we did just start solids this week. Any insight or suggestions would be very appreciated. I have a 13 month old girl who, for the past three weeks, has not taken her morning nap. I have laid her down normal time, tried extending waketime, etc and nothing has worked. I have laid her down for the second nap a little earlier and she will sleep for 2 hours for the second nap. She has been teething during this time as well. Does this sound to you like the morning nap is ready to be dropped, or a sleep disruption due to teething? Thanks for your help!! either is possible and there are a lot of other possible reasons (like working on a new skill). I would wait it out before dropping. BW says the drop between 14-22 months, so I would wait until 14 and evaluate the situation. I need your help. I have been keeping a journal for 2 weeks. Gabby skipped her PM nap 1 day each week and also took very short naps when she did sleep (in the pm). I don’t know what to make of it. I don’t know if she is about to walk and she is just wanting to play or if she does not need her morning nap anymore. She is 14 months old. I thought maybe she was too young to drop the morning nap and she sleeps so well for that morning nap. She can sleep 2 – 1.5hrs. for the morning nap and then just take a 45 min. nap in the afternoon or no nap at all. Ugh. Do you think I should try to cut back the morning nap to 1hr or go ahead and drop it? I just feel like I am between a rock and a hard place trying to figure out what she is doing. Any ideas? My son has just turned 11 months and is about to crawl – he rolls everywhere. I have a few questions.He is normally up at 8 am and back to bed at about 11.45 am (is this a long enough wake time for an 11 month old?). He will stay in his bed for 2 – 2.5 hours (sometimes I need to wake him, other times he just lies in his bed waiting for me). I then put him down for a short sleep just before 5 pm (he doesn’t even seem tired though) but in the last week he has just cried and will not go to sleep. Should I just forget this second sleep and give him some quiet time instead, or should I try to get him to sleep in his pushchair?He has also started to wake early in the morning (crying out but normally going back to sleep again) any time from 6 am onwards. Do you think that’s because he only gets one decent sleep a day (‘sleep begets sleep’) or could it be because he’s learning a new skill – crawling?He moves around his cot and this morning he was actually sitting up in his cot when we got him up – first time ever!Last question – what are your thoughts on putting toys in his cot so that if he does wake early he could play with these until we get him up? ?Many thanks for ALL your help. Jennifer, I would first add waketime before her afternoon nap. Kaitlyn recently started doing that and I just didn’t believe she was ready to drop the morning nap yet. Adding 15 minutes of waketime before the afternoon nap did the trick.If that doesn’t work, try cutting back on the morning nap. To do this, I would try adding waketime before the morning nap also.If that doesn’t work, try dropping the morning nap. It really is nice when they drop it, you just don’t want to do it before they are ready. Maria, your morning waketime actually sounds too long to me. He could be waking for many reasons, but I would first address the daytime naps. I would put him down for a morning nap around 10:30. Let him sleep for 1.5-2 hours. So he is up by 12:30. Let him have 2.5 hours waketime again, then try another nap at 1.5-2 hours.I would think it is fine to put a stuffed animal or two that are totally child safe (nothing that can come off and be choked on) in his bed to play with if he wakes early. Here I am again with yet another question. The whole “progress is a spiral” is so true! I feel like once an issue is solved, things go good for a week or two and then we either back track a few steps or there’s a whole other issue at hand! I am so thankful for your blog.My son will be turing 16 weeks in a few days (not quite at the 4 month mark yet though). We have eliminated the DF and he is now sleeping from 8-7. He continues on his 3 hour schedule with 75 minutes of waketime. Normally, things go very smoothly but lately naps and his nighttime sleep have been disrupted. He wake Sometimes his naps go well with 75 minutes of waketime, sometimes they don’t. When they don’t it made me think maybe he needed a longer waketime. I would try that, and again, sometimes it would work sometimes it wouldn’t. So now I’m left twiddling my thumbs wondering which waketime was better. He always goes to sleep easily but sometimes he wakes during naps or wakes 30-60 minutes early.Then I thought maybe he doesn’t need that 4th nap anymore since it’s only 30 minutes anyways. But no changes. In fact, that’s when I felt his nighttime sleep was getting disrupted and he started to wake early. And of course he is extremely fussy at the time. So today I thought I should keep giving him that 4th nap. I put him down after his waketime and he just cried. I said forget it, and got him up and we went to run errands. Well he ended up taking his nap in the car from 6:30 to 7. Just in time for his last feeding.What am I doing wrong? Is he not ready to drop this 4th nap? Is his waketime not long enough? Should I put him down early to give him 12 hours of sleep at night versus 11? He is also swaddled for naps and night and I wonder if maybe it’s becuase he’s ready to drop that. But honestly, he goes to sleep so easily with it that I think taking it aways would cause more issues. Help! Hello! I have a 14 month old who is teething and started walking 1 1/2 weeks ago. She has not taken a morning nap in a month. Now, when I lay her down for her afternoon nap, and wakes after only 30 minutes, screaming. I have tried giving her Motrin before naps, giving her a bath to soothe her, even putting her in her swing after she awakens, but nothing seems to help. Nighttime sleep has not be affected (7:30pm-8am)Any suggestions? Thanks so much! Thanks for your help plowmanators! After playing with his waketime I realized he needed more. Now his naps are great again and his 4th, like you said, we will take day by day. Soon, we will also work on dropping the swaddle.In thinking ahead, I was wondering what happens when he moves to a 4 hour schedule. Currently his schedule is:7am – wake/feed8:30 – nap10 – wake/feed11:30 – nap1pm – wake/feed2:30 – nap4 – wake/feed5:30 – nap (sometimes, usually 30 minutes)7pm – feed7:30 – bath8pm – bedWhen he moves to 4 hours is he supposed to take a full nap for his 3rd and sleep until his 7pm feeding? I can’t imagine him going right to bed after a regular nap like that in the evening since he will be unaccustomed to it by that point.Also, as you can see my bedtime routine is feed, bath , then bed. When we start solids I will probably have to feed earlier than 7 so that I can get him to bed by 8 if I stick with this routine. What are your thoughts/suggestions on that? Hi There! Thank you so much for all the wonderful information on your blog. It has helped me a great deal! I was wondering about dropping a nap. My son is 11 weeks old. Every day when I try to put him down for the mid-afternoon nap (which is after a 4pm feed.. so usually around 4:45-5pm) he cries and cries. I can sometimes get him to calm down if I give him a pacifier but then when it falls out he will cry again. After 45 minutes- 1 hour I will pick him up & hold him. At this point he is so restless and fussy until I feed him at 7pm. Some days he will sleep a the 4pm nap but then he will be fussy like I explained above at the 7pm nap. He is fairly perfect for all his other naps. We have been doing a 7, 10, 1, 4 schedule since about 4 weeks of age. Do you think I should try to drop his 4pm nap? If so, should I just try to keep him up and happy during that time or should I try to let him sleep a little? If I drop that nap then should I then move up the rest of his schedule? Thank you for your help!! LEM, be sure to see sample schedules post to see samples of what it was like for my kids on 4 hours.Your son might take a full third nap, but might (and eventually will) take a short third nap just like he did for the fourth.For solids, you can feed them at the 4 feeding instead of the 7 feeding. Or you can start things earlier if baby will eat earlier. mkk23, it sounds like this is his fussy time of day. He seems young to be dropping a nap altogether, so first I would try a swing or bouncy seat or something for this one nap to see if he will sleep. If not, you can try dropping the nap and see how he does, but my guess is he needs 2-4 more weeks before dropping it. Hi! Congratulations on your 3rd. I”m so excited about your blog! I read Baby Wise I but didn’t know II existed until recently :(. I have an 11 mo. old son and I live on the east coast but my parents are on the west coast. We visited them for a week in mid summer and ever since we got back he started waking up very early in the morning, 3-4am. WE’ve been able to move it to 5:30am to nurse and then he goes right back to sleep until 7:30-8am, but he used to sleep 7pm-7am. I’ve assumed the 3 hour time change threw him off and would love to get back to a later wake up time, even 6am would be great! We’ve tried putting him to bed later around 8pm and that helped get us to 5:30am but I’d love to get him into a normal wake up time. Any suggestions?? Thank you!! Hi, Ive posted a couple comments about a week ago and for some reason they haven’t shown up! I’m desperate, please help! My baby’s been waking up from naps after 45 mninutes since she was 8 weeks (although the problem has just increased). I fed her right afterwards to see if she was hungry. I think she was at first, but now she is definetely not. She is now 11 weeks old. She is still doing it. My question is, since shes almost 3 months old, and shes sleepiong for 10 hours at night, does she need to drop a nap? She usually only stays up for one hour before getting fussy, in which I put her down and she only sleeps for 45 mninutes. Half the time though she cries afterwards but her eyes are open and shes wide awake, but crying. I woujld love to keep her up longer but she gets upset. Ive kept her up fussy, and sometimes she still only sleeps 45 minutes. She used to be a two-hour napper that I would have to wake up. Her schedule is very erratic right now bc she wakes up at different times from all naps so therefore her feedings are erratic, and the days are always different. PLEASE HELP ME!! Shes 11weeks old. My LO is 4 months and I’m looking to drop her 4th nap after the time change on Nov. 2. I was curious if you’d look at our schedule and share your thoughts with me on how best to do this.As of now we:8am-feed9:30-nap11-feed12:30-nap2-feed3:30-nap5-feed6:15(ish)-nap7-feed8-bedShe is sleeping 12 hours thru the night. Is a 3 hour wake time too long? Would you adjust our bedtime or our morning wake time to get an earlier start? I just started the BW method and my baby is already 9 weeks old. He was used to all the wrong things so its been hard for him. I lay him down for naps and he cries the whole time. My question is should I slowly implement the self sleep or should I make him cry himself to sleep for every naptime and at night? He’s just so tired. Plus, I wanted to know how long was too unhealthy to let him cry for… Thank you. Burkes,I would perhaps move bedtime up if she needed it. She might sleep more than 12 hours–if so that is okay. You might need to pump if you are breastfeeding before you go to bed. She might make it to her normal bedtime. If so, great. Just drop the nap. If not, try an earlier bedtime and see if she will still keep the rest of her day the same. Ashley, See these posts:CIO Bootcamp: http://babywisemom.blogspot.com/2007/11/cio-bootcamp.htmlNap Cues : http://babywisemom.blogspot.com/2008/03/nap-cues.htmlWaking Early From Naps/Won’t Fall Asleep For Naps: http://babywisemom.blogspot.com/2008/01/waking-early-from-napswont-fall-asleep.htmlGetting a Consistent Schedule: http://babywisemom.blogspot.com/2008/01/getting-consistent-schedule.htmlStarting Babywise Late: http://babywisemom.blogspot.com/2007/12/starting-babywise-late.htmlStarting self-soothing slowly is more than likely not going to work. Consistency is key to success. See these posts and you will get a better idea of what to do. My 10 month old is trying to drop her morning nap, ACK! She typically wakes between 6 & 7. Her bed time is 7:30. She does 1-2 hours for her afternoon nap. Her morning nap is about 45 mins, if she ever goes down. Any thoughts? My son Braden is 12mo next week. Thus far has been a terrific napper, only dropping his 3rd nap around 10.5 mo. Bedtime 7pm to 7am. Lately he takes about an hour and a half nap in the morning at 9:15 then shows signs of readiness around 1:30 but won’t fall asleep. He began walking about half the time recently so lots of new things on his mind but I don’t feel he is ready to drop the nap because he gets so fussy. He will fall asleep sometimes only after about an hour of CIO. In the mornings not a peep when he falls asleep. Lately he has been throwing his lovey blanket out of the crib for the afternoon nap but won’t sleep without it so we’ve been playing that game. Any tricks for that? I left it out of the crib yesterday and he fell asleep after about an hour of CIO but only slept for 30min. Rachel, one idea for you is to shorten that waketime between the two naps. It looks like he has 2 hours 15 minutes in the morning and then 2 hours 45 minutes between the two naps. My guess is he needs the two waketimes pretty similar. I would try that first.The lovey blanket is a hard one. I might try giving it to him but telling him it is the last time, see how that goes. Or waiting the first time to give it to him. Tell him that is not acceptable…I don’t really have any experience to draw from there. I just wanted to say THANK YOU so much for this blog! I love the idea of BW but am often for a loss on how to implement the concepts/changes. Every time I am faced with a new change I check here. I ALWAYS find the answer I am looking for. THANK YOU, THANK YOU, THANK YOU! Val, thank you for your blog once again! You have been very helpful to me. So, supposedly the 3rd nap is not supposed to be dropped until 6 months at the earliest. My LO is 5.5 months and it showing EVERY sign of needing to drop a nap. She is playing in her crib before naps, she is resisting bedtime periodically, her night sleep has gone down from 11 hrs to 9 hrs, in which she wakes at 4am, goes back to sleep at 445 and wakse again at 530 ready for teh day. And the biggest thing- she’s happy all the time! This has been going on for the past two weeks. I thought maybe it was related to not getting enough sleep, as after nap training it seemed to get WORSE (her sleep was not good during this period). BUT it has continued, and naps are so much better. In fact, instead of waking at 5 liek she was doing, she is waking at 4. The time she wakes in the morning has gradually gotten earlier and earlier over the past two weeks.Do you have any thoughts or advice on this? I haven’t heard much about toddlers and nap trouble! I am having new nap trouble with my 20 m/o son! Previously a great napper (2hr naps twice a day) then, since we have tried to drop his morning nap, he only sleeps 45 minutes! Sounds overtired, right? Well, now he won’t go back to two naps either! What have I done?? ?I put him down at about 1130 am (he wakes at 530am:)!!! He wakes fussy and exhausted. Is this just his age? Should I just let him CIO? Any moms of 20month olds? I am trying to decide if my 4 month old son is ready to drop a nap before moving to a 4 hour schedule. He is on a 3 hour schedule which currently looks like this:830 wake upnap 930 for 2 hours1130 wake, eatnap 1230 for 2 hours230 wake, eatnap 330 for 2 hours530 wake, eatnap at 630 for about 45-60 minutes715/730 waketime800 eat830 bath/bedFor the past week or so during his last two naps he has been waking up throughout fussing. Sometimes he will doze back to sleep on and off and others he will just lay there and cry. I try to leave him in there until he is scheduled to eat again so that I do not mess with the cycle. He has also been waking earlier then he usually does in the morning and again I leave him in there until 830 waketime. His waketime is only an hour so I’m not sure that he is ready for a 4 hour schedule.I guess I’m not sure though. When he is ready for a 4 hour schedule how long should his waketime be and how long will his naps be? Anyway, I am not sure if this waking during these last two naps means that he is ready to drop one. Any thoughts from anyone will be greatly appreciated 🙂 How do I know which nap to drop first too?? Also, if I drop a nap will he be taking longer naps to replace the nap he is skipping??? Thanks so much!!! Alison, For all things “4 hour schedule” see the label “four hour schedule.” Right now, he isn’t ready. You want to drop the dreamfeed first.I think he likely is ready to drop a nap, and that would be the 6:30 PM nap. He might have an earlier bedtime once you do–at least for a few days/weeks. Also, he can be awake for 30 minutes before feeding. First of all, I'd like to thank you for this blog… it is SO nice to have this site as a reference. I'm not sure I'm in the correct section to post (I have a bunch of questions), but I'll give it a try. I have twin boys that will be 12 weeks old in 2 days. We started BW when they were 3 weeks. All in all I think they do a great job, but I am beginning to get nervous that we aren't doing something right. They are just about sleeping through the night- only 7.5ish hours. Grant is a little more consistent with that than Connor, who sometimes only makes it 5 hours. Should they be sleeping through the night consistently by this point?… more than 7 hours? If so, does this have to do with their nap/waketime schedule? I feel like we have way too many naps after reading some of the other posts. They have an hour of waketime and then nap for 2 hours, so we are on a 3 hour schedule. Here is what our day looks like:6:30am- feed7:30am- nap9:30am- feed10:30am- nap12:30pm- feed1:30pm- nap3:30pm- feed4:30pm- nap6:30pm- feed7:30pm- nap9:30pm- feed & bath11:00pm- bedFor the most part (unless it's an off day) they go down for their naps without any, or very minimal fussing. They do typically get a little cranky for the last nap, but once they fall asleep they always sleep very well for this nap… probably the best of the day once they get to sleep. There isn't ever a night where they wake themselves up from the last nap… I always wake them. Any suggestions on what I should be doing differently would be greatly appreciated!THANK YOU SO MUCH! Andrea,That isn't too many naps. One thing is you should think of 7:30 as bedtime, not a nap. I would move the bath to after your 6:30 feeding. Then I would put them to bed. get them up at 9:30 and do a dreamfeed, which means you do not have waketime and you don't even really wake them up. Since they don't wake on their own, I would push that 9:30 back to 10 instead. Feed and then put right back to bed. I have a 2 year old daughter who has been napping for about 30-45 mins in the afternoon for about a year now. She sleeps 12-13 hours a night and is well-rested and happy. She seems to be one of those kids who gets all her needed sleep at night. However, recently she has stopped sleeping at all during "nap time." She is happy to go "down" but just talks and plays and never sleeps. I think this if fine as she needs rest time whether or not she sleeps. My question is how long is realistic to have her stay in her crib if she is not sleeping at all? She tends to whine and cry after about 45 mins. should i let her fuss and keep her in her crib? If so, how long is appropriate at this age? She also does "room time" in the morning for an hour. I am having baby #2 soon and would like to have a more extended time for me to rest in the afternoon! But what is realistic to ask of my 2 year old? Thanks in advance for your help! I have a question about dropping the 3rd nap. My daughter will be 5 months this week and for the past couple of weeks she has really been fighting the third nap. She gets so upset and it takes so long for her to go down that it is almost bedtime sometimes. She hasn't been sleeping as well the past couple of weeks. I had attributed it to the 4 month sleep regression. She went from sleeping 11-12 hours per night, to waking all through the night or getting up to party at 5:00am! Yesterday, I tried waking her from her naps at the 1.5-2hr. mark, but her last nap was only 30 mintues (she fell asleep in my arms after I had gotten her up). I kept her up an hour later than normal to see if that would push her wake time back, it didn't. I pretty much made her take a third nap last night. She did sleep better, as in through the night. I didn't have to go check on her once until I heard her playing in her crib. I left her there hoping she would fall asleep until 7. I finally went and got her up at 6:45 because she hadn't gone back to sleep and was getting pretty fussy. Today she went back down for a 2hr. nap at 9, then again at 1. It just seems like such a long time for a baby to be up (3pm-7:15pm) at 5 months, but I can't figure out an effective way to get her to take the third nap. I have tried letting her CIO for an hour, patting her, rocking her, you name it! Should I just drop the third nap to save both of our sanity? Also, How do I get her to sleep past 5:30 am again??? I have tried giving her more formula and letting her have a little rice cereal at night, but I figure if she wakes up in a good mood at 5:30 and can wait to eat until 7am, it isn't hunger. I am so frustrated I don't know what to do? Thanks so much in advance. LMP, At that age, she really does need a nap still–even if it is short. She is likely going through normal two year sleep disruptions. I would try leaving her in there for about 2 hours. You could give her a book and see if that helps her to sleep better and remain happy while resting. You can then experiment with how much time she needs in her room. Chances are good that after a few months, she will go back to sleeping most days. Melissa, I would try working with her waketime before her third nap. McKenna does about 55-60 minutes before her first nap, but 1.5 hours before her third. If it is shorter than that, she takes a short nap and protests going down.It is pretty normal for baby to wake at that time and talk to themselves. It isn't just a BW thing, it is a baby thing. If she is happy, I would just leave her and she will fall back asleep eventually. Our daughter is 8 months old and has been taking 2 naps for almost 3 months now. Her afternoon nap is normally 1 1/2-2 hrs, which cause her to wake bet. 2:30-3. Every day she is SO cranky after she wakes from her afternoon nap. She rarely plays, wants to be held, and is fussy unless we go for a walk or I need to run errands. Her bedtime is 6:30, she goes down w/o a fuss, and wakes at 6:30am. Do you have any good suggestions in making her happy for those last 3-4hrs? Some days I just give her "quiet time" in her room, just so I can get a break. She usually plays or cries, but never sleeps. It makes for a very long afternoon. Jessica, since she is waking cranky, I would guess that she is still tired, so I might try seeing if you can get her to take a bit longer of a nap.As for activities, try singing songs, varying what you do (don't spend too long at one activity), and also finger foods can be good during this time. Maybe a long bath? Lookhart Photography,Transistions are hard :)If she is still at 4 naps and you want to stick to a 3 hour schedule, then I would just drop that fourth nap. That is what I did with my older two children. Hello! My daughter will be 14 months in a couple days and she is not wanting to take her morning nap. She sleeps from 7-7 (some mornings she does wake up later, but always before 8). Her nap schedule normally is 9am and 1pm. I've tried giving her a nap later (9:30), but she still continues to talk for an hour. When she goes to sleep at 1, she never sleep longer than 2hrs. It's almost always 1.5hrs. (Which is how long she naps when she has 2 naps).My question is, could she be in the weaning process? Some days she is happy w/o that nap, but other days she barely makes it till 1. Any suggestions?? Thanks-Jessica M.
Jessica, it is possible she is ready for one nap (at a weaning point as you say). It is also possible that she is at the point described in "dropping the morning nap (2 to 1 naps: Transition Time"
Our baby is 12 months and is doing excelent with babywise, even we had some problems. She is now on 2 naps – first 1,5-2hrs and second – 45 minutes. We feel she is ready for one nap, because she would want to sleep more in morninig (wake is around 8.8.30h, first nap is around 11-11.30hrs, wake is 13-13.30 hrs, and second nap is around 17.00, and sleep is around 21hrs) but that there would not be enough time for second nap? Monica, probably not ready for one nap, but likely ready for a transition period. There is a nap titled "dropping the morning nap transition period" or something. Basically, you would want to shorten the morning nap a bit to help her be tired enough for an afternoon nap. Nino, at 12 months, she isn't ready for one nap. If she doesn't need two full naps, I would take the morning nap down so it is shorter.For more guidanace on this topic, see the post "dropping the morning nap: transition time"
thank you! he never would sleep longer than an hour and 15 min, so i assumed he must not be ready yet. we will try again later, and hope for longer naps! i was giving him lunch right before his nap when we were tryong one nap… and he was always pooping and that was what was waking him. but i don't know of anything to do to prevent that! Hi!! I just recently found your blog about 2-3 months ago! It has helped so much, thank you!! My baby girl is 6 months and her schedule has just been a mess. At 4 months everything was golden. She was taking great naps and sleeping from 9pm to 7am every day. And then my husband and I went out of town and baby was with my parents. My mom decided she needed to hold her for every nap and did a "baby led" schedule. Ugh!! I get home and everything is a mess. Come to find out she also had an ear infection. Okay….so maybe she wasn't doing well at my parents because of her ear. It took 3-4 weeks to finally get rid of the ear infection and now we've hit 6 months. She's now teething. She has been consistently waking up between 4:45am and 5:30am. Sometimes I can give her a pacifier and she'll go back to sleep. Other times she cannot be soothed at all. Then the rest of the day is pretty much out of whack. She does go down great for her first nap of the day but the rest of her naps are WWIII. Once she is asleep she'll sleep about 1-2hrs. So then I'm torn on whether or not to wake her to feed her or just let her sleep. I am still doing 4 naps because she's so tired all the time. Bedtime isn't too bad because I think she's just exhausted. I guess my question is have we just had a string of bad luck? Us being out of town, ear infection, teething, maybe hitting the 6 month growth spurt – all at once. Or is it just taking a really long time to get back on schedule. I am just really at a loss and have no idea where to go from here. Holboes, I would guess you had a lot of bad stuff happen at once. You might want to approach things as though you were starting BW late. It might give you more solid direction on what to do. The good news is that she should bounce back rather quickly, but you will likely have some rough days in there, first. Hello! Thank you for your blog, I reference it often! My dilemma right now is my daughter will be 5 months old in 2 days and we have been doing BW consistently since she was 6 weeks old. She has responded to it so well. She started sleeping through the night at 6 weeks. She has always taken pretty good naps, with some bad ones here and there, but nothing major. Now all of a sudden she is taking horrible morning naps. She usually wakes up at 6:30, I feed her and then she would eat at 10, 1, 4, 7 and right before bed at 8. I thought maybe since she was stretching her feeding in the morning from 3 to 3.5 hrs sometimes 4 hrs on her own, that she would be ready for a 4 hr schedule, plus I wanted to eliminate the 2 naps in the morning to just 1. I have been trying to decide if she is ready to move to a 4 hr schedule, but she can never make it from her morning nap until her afternoon nap without the middle nap, which is usually only 45 to an hour as well. So it messes up the whole eat, play, sleep up. When trying the 4 hr. schedule I tried to have her wait until 7 to eat, which she does no problem and then I had her feed at 11, 3, 7 and right before bed, but she wasn't napping well and couldn't make it to 4 hrs for all of the feedings so I dropped that idea. So I am back to the 3 hr. schedule, but I just can't figure her naps out, I'm pulling my hair out trying to figure it out. She has been sleeping great at night through all of this, so I don't understand. She has also been on solids for almost a month now and has done really well. I have tried moving up her morning nap to 8 and delaying her morning nap to as late as 9 (when I was trying the 4 hr schedule), but no matter what I do she only sleeps 45 min and this morning it was only 30 min. Based on what I am reading she might have to long of waketimes or be overstimulated for her waketimes, but I'm not sure because I have tried shortening her waketime and prolonging it. She used to take amazing morning naps, 2 to 21/2 hrs, a 45 min. mid nap, with a 2 hr afternoon nap and a small evening nap. That was up until about a week and 1/2 ago. She takes good afternoon naps for the most part still, usually 2 hrs. Except for the one day when I skipped her middle nap, she only slept for a little over an hour. I have read so much on this subject, but still can't seem to figure out my daughter's situation. I also feel like she should be napping only 3 times at her age, but I just can't figure it out. I also don't really understand what nap is considered the 4th and which one is considered the 3rd, in concerns to dropping naps. If you could help clarify that would be great! Thanks for any help on this subject! I forgot to add that I thought maybe it was just the 45 minute intruder, but I think its more than that now, I don't know though. Any help would be greatly appreciated.. thx again! So sorry, I keep remembering key pieces to my dilemma. My daughter also seems ready for a 4 hr schedule because she usually sleeps through her 4pm feeding if I let her, so she can go 3.5 in the morning and 4 hrs in the afternoon, but usually can only go 3 hrs between her 10 and 1 feeding, so then this causes her to have to nap 4 times in one day. Katie, For the morning nap, figure out what has changed. If nothing has changed, then go to her waketime length when naps were perfect and then add 5 minutes to that length. Add five minutes at a time until you find the right length.But do see the post on 5-8 month sleep disruptions. It could be a growth spurt or teething.The naps are after the 6:30 feeding, 10 feeding, 1 feeding, and 4 feeding. Then after 7 is beditme. You can drop the nap between 4 and 7. Good luck! Hello! I love your blog and all your great advice, it has truly been very helpful! Nap issues have always been our struggle.. from length, to suddenly changing right when we had a routine going. My daughter just turned 15 months, and it seems pretty clear she is ready to go to one nap. Since weve switched Ive tried to put her down at her same afternoon time 145-2 and she will barely sleep 2 hours. Also she has been waking up at 6am in the morning, after we put her down at her usual bed time of 8pm. I know this cant be enough sleep. I do not know how to switch to 1 nap and need some help! I thought the nap was supposed to be longer! Any advice is welcomed! Denise,Try putting her down more around 1 PM–maybe even 12:30. Good luck! Hello! Ive tried putting her down at 1230 and she barely sleeps 2 hours. I feel so frustrated, arent they supposed to take longer naps? She isnt getting much sleep or a good enough amount it seems for a whole day.. Any tips? Well they eventually get the hang of one nap? Some babies only need two hours. Most will sleep about three.It is possible she isn't quite fully ready for one nap a day and therefore isn't sleeping as well as she could because she is slightly overtired. You can see the post on naps transition time. It will give you ideas on what to do if she isn't quite ready for one nap a day. Hi everyone! We have used BW for both of our kids. My 11 month old VERY active and crawling baby girl is doing great and has slept through the night since she was 9 weeks. Her schedule is:7:30 Wake and eat9:00 Nap (1.5 hr)10:30 Wake and eat12:00 Nap (2.5 hr)2:30 Wake and eat4:30 Nap (cat nap)5:30 Wake and eat7:30 Bottle and bedtimeShe sleeps great for the morning nap everyday like clock work. The afternoon nap she sometimes plays and sings to herself for 30-45 min then goes to sleep but doesn't fuss much. I want to transition her out of the late afternoon nap but most days she is so scheduled and gets cranky right at 430. She may not always go to sleep for very long and usually fusses but def still seem to need the nap. What else can we be doing to adjust her sleep so she can drop this later nap?Thanks for your insight. Unknown,Kaitlyn was 11 months old (I think–right about there) when I had to force that third nap out of her, also. There is probably a post on it somewhere. I think what we did was just drop it cold turkey. We would go out of the house so she could be distracted. We also did an earlier bedtime by 30 minutes until she got used to the dropped nap. Ashley, I would say it has nothing to do with the nap. I would say it is the two year sleep issues combined with him being able to get out of bed.My friend did something I think is a great idea. She had a pack n play set up in the bedroom and if her child got out of bed, she would put the child in the pack and play. I have this in my head as something to do if McKenna ever decides to fight me on staying in bed :). So I would work on getting him to stay in bed and then not worry about it from that point. I've been having trouble with my almost 7 month old's naps. After following BW since day 1, he got sick 3 weeks ago and hasn't been the same since In regards to sleep even though he's well now. He's been waking up at 6. I'm feeding him and putting him back down before 7. At 9:30 he wakes up, I feed him, then try to put him down for a nap between 10:30-11:00. He stays awake for an hour then starts crying. I get him, he stays up playing until I feed him lunch between 12 and 1. At 2 he goes down for his nap and wakes up before 5 for dinner, bedtime routine, and one last feeding before going to sleep before 7. In reading everything, he should still be taking that 2nd nap so the cycle of eat, play, sleep continues but he's just not sleeping and seems to be transitioning to only 2 naps a day! But I think he's too young for this! I know the first naps to drop are the ones in the evening, so what can I do to make sure baby gets his rest after his 9-10 am feeding? Prior to the illness, he was waking up between 7 and 8, and was on a 3-3.5 hour schedule, and eating, playing, and sleeping just fine. Janel, I think it is possible you have fixed this with the time change. If not, I would suggest you see the post "early morning feedings before waketime." If you choose to feed at 6, I would keep him up. Or I would feed and then get back upt at 7. Ideally, I would get him to go back to sleep without feeding and hten get him up at 7.Also, you want a consistent morning waketime within 30 minutes. So instead of a range of between 7-8, it should be 7-7:30, or 7:30-8:00, or 7:15-7:45, etc. My son is 15 months old and started displaying a lot of signs that he was ready to move to 1 nap a day a few weeks ago (not napping in the afternoon at all, etc.) I wanted to wait until we got back from vacation so it would be an easier transition, but vacation actually forced him in to one nap a day – and he did great! He played all morning and slept for 2-1/2 to 3 hours every afternoon. The first three days after we got back he continued to do well, napping anywhere from 2 to 3 hours a day. So, he went about 10 days with a great afternoon-only nap routine. However, the last 3 days he has been shortening his nap every day, and I don't know what that means or what to do. He has only slept an hour and a half the last 2 days. He seems much happier and better rested now that he is on one nap a day, but I don't think that will continue if he takes such short naps. Granted, he has never been a good napper, but I'm still concerned. I tried to switch him to one nap a day a couple months ago, the same thing happened, and I decided he just wasn't ready. Do you think the same thing is happening again? But if so, why won't he sleep for an afternoon nap when he has two naps a day? I just don't know what to do. Any help would be great! Just an update – he started acting pretty tired in the morning, so I switched him back to 2 naps a day. He usually takes a good morning nap and only a 45 minute afternoon nap, but he doesn't seem unhappy or overly tired once he is fully awake. He can do one nap a day if he is very stimulated during the morning (i.e. playing on the beach or with other children), but that is not feasible for me all the time. So… should I just wait a while longer? Try to slowly transition him by shortening his morning nap? Let each day be different? My daughter is 12 months and from birth to 10 months has been a great sleeper with us following BW. These last 2 months with her being more mobile in her crib & talking to herself, she very frequently starting playing in her crib during nap times (never at night). She doesn't cry, just plays & talks (no toys in her crib). I've tried for about 2 months to figure out what's going on. I've tried adjusting her nap times a bit to see if I'm letting her stay up too long, or maybe I'm putting her down too early. I've tried letting her be for awhile (she's played for over an hour at times) & I've tried going in and telling her to lay down. I've tried getting her up to play & start over in 15 mins and I've tried just getting her up & skipping the nap altogether. What seems to be happening now is that she is playing in her crib through afternoon nap (or I finally get her up) and then she needs to sleep at like 530pm which is really early for our schedule. Ideally, she will sleep 7pm to 630am and nap 930 to 11 and then 2 to 330. Any help or suggestions you may have I would so appreciate! I've scoured your site for tips and as you can tell, I've tried many suggestions. But I'm just not sure what to try or stick with at this point. Thank you! I need help! My 13 month old son has been a poor napper his whole first year of life. He sporately naps well on occasion. He began showing signs of being ready to drop from two naps to one nap a couple weeks ago when he would take an hour morning nap, but little to no nap in the afternoon. I began nap weaning him five days ago and things are not going well. On the third day of nap weaning he cried through his morning nap and has not been willing to take a morning nap since,but is not taking a good afternoon nap whether the morning nap is offered or not. The one remaining nap has been less than one hour every day!!! When he awakens after only 30-45 mins of nap I usually let him try to get back to sleep, but he has just cried and played through nap time. His naps have always been short like that since about two months into the two nap schedule. His morning nap would sometimes improve for a period of time, but then it would shorten again. He is my second child and we followed Babywise with our first without a hitch so I feel hopeless and helpless to know what to do in this situation. Do you have any advice for me? My son is 6 months old and a week ago he dropped his dream feed (1130pm feed) so now he is sleeping from 9pm-8am. He takes a morning nap at 9:45am, an afternoon one at 12:45pm and then another nap at 3:45pm. He is not napping well for his 3:45pm nap anymore (will nap about 45 minutes). If I were to drop that nap, he would be up from 230pm until his bedtime at 9, that is WAY too long. So would I drop his 12:45pm nap instead and then keep his 3:45pm nap, that way he is only up from 1130am-3:45pm (4.25 hours there instead of 6.5 hours later)? Help! He has not moved to a 4 hour feeding schedule yet either…so trying to implement that at some point but not sure when. Hello!Thank you for all the time you've put into your blog!I have a 19 month old who has been on BW since day 1. He's always done well with it and has always been an 8-8 sleeper. Around 13 months (whichI know is early), I dropped his morning nap due to him waking way too early. After the initial transition, he was sleeping til 8 again every morning. Now he is having issues falling asleep at night. He has almost always (even since he was a really little guy), fallen asleep quickly and without hesitation at bedtime. For the last 4 weeks or so, it has taken him anywhere from 45 minutes-2 hours to fall asleep. He doesn't fuss – just plays. He takes his afternoon nap from around 1-2:30 and has a great disposition and attitude still even after taking forever to fall asleep. In the last 2 months, we have weaned him of his paci and he has been in a big boy bed for 2 weeks due to baby #2 being due in 6 weeks. He's obviously going through several transitions at this time. I've been very consistent at keeping him on his schedule to try to knock him back into falling asleep closer to his bedtime, but it just isn't working. Part of me feels like I should try dropping his nap, but it also freaks me out! I know that would be very early, but is the thought that "some babies don't require as much sleep" true? I have heard so much "advice" from people who don't do BW, so my head is reeling. Any advice you could shed my direction, would be wonderful. Thank you! No! Don't drop the nap for sure. Have you trid an earlier bedtime?I would actually assume he is taking a long time to fall asleep beicse he has no pacifier anymore. That is a huge change for him. There is a certain element of it being normal–but usually around 2. I would just give him time to get used to no paci. Another element to consider is how much exercise is he getting right now? Less movement in the day can lead to beig less tired. Thanks for the response! I thought dropping the nap was a bad idea. I'm just at a loss! I haven't really considered an earlier bedtime, but that does make sense. He has been waking earlier – definitely no later than 7:30 every morning and most mornings around 7. So maybe he is overly tired especially since he doesn't nap very long in the afternoons.You gave me a lot to think about! The first thing you want to consider is hunger. If not that, do you think it could be that she needs to be awake longer before you put her down? Or more physical exercise? Or she is teething?